The revolutionary new easyturn system is here. Launched at the NBF bed show, this system cleverly addresses the issue of ease of turning. 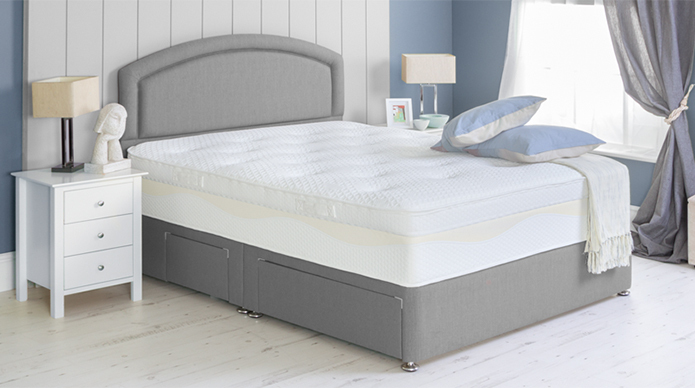 Quality mattresses will have better fillings and often more of them, this traditionally makes the mattress difficult to turn. Of, course you could buy a no-turn mattress but often this leads to a shorter lifespan. Hush-a-Bye’s solution is ingenious. Why turn the heaviest part of the mattress (the springs) when this section receives little wear. So we have made the top part of the mattress double sided, which allows you to turn the mattress with ease, even single handedly. There are three models in the range with either 1000 or 2000 pocket springs. Of course actions speak louder than words so have a look at the video on the website to see just how easy easyturn is. 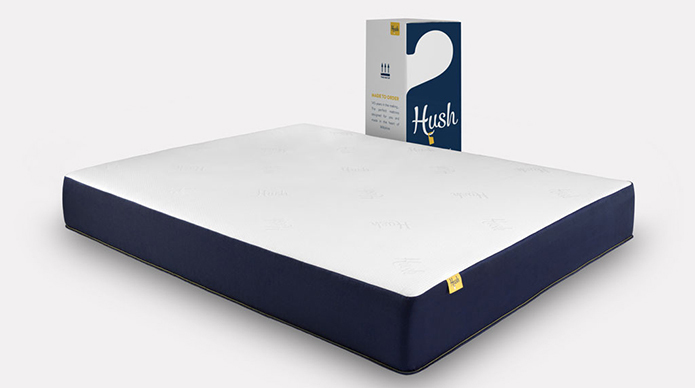 The new Hush Premium Rolled mattress is here. The Hush Premium Mattress has landed and we are thrilled with the result. This style of mattress has become like the cool uncle of mattresses. Over recent months there have many newcomers to the market but these are mainly foam, with some offering micro-springs too. 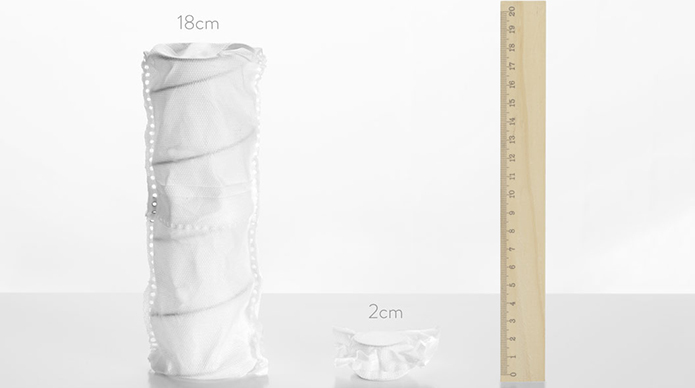 The Hush Premium combines memory foam and full length 18cm pocket springs. The best of both worlds. 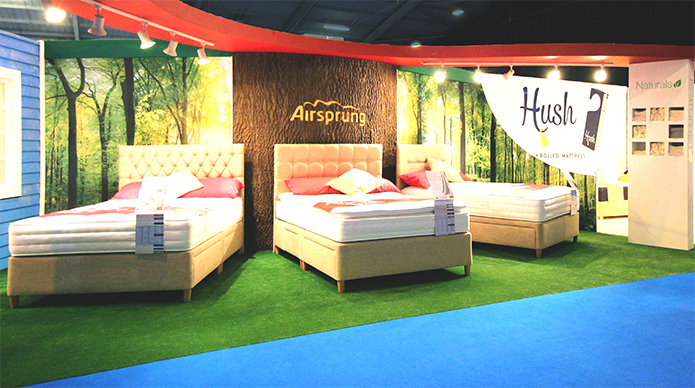 The difference with these newcomers is that the Hush mattress has been created by Airsprung, which has 145 years’ of manufacturing experience. Beautiful, stylish and incredibly practical. Visit www.hushsleep.co.uk to get a bit of the action. Well there we are; another year and another fantastic bed show. Anyone who’s anyone has a stand at the annual exhibition and it’s the place to be for buyers and commercial specifiers who are looking for the latest products and developments in the UK bed market. Airsprung has been working tirelessly to create a naturally beautiful range and this week we were finally able to show them off. We had a giant tree, a boutique room and a team of people who were ready and raring to talk about the new and exciting future at Airsprung. We met some fantastic people and we are really pleased with the overall response. If you were there then hope you had a great time and we’ll see you again next year! 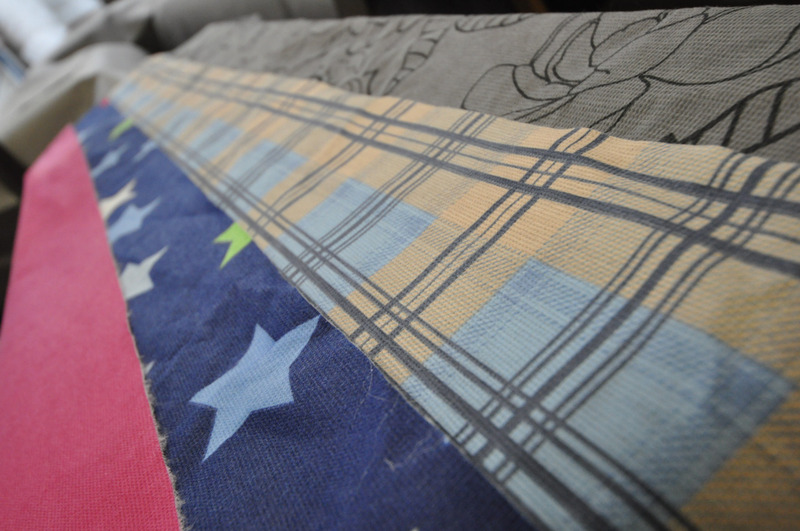 Airsprung Beds are proud to be working with a number of Wiltshire primary schools in a new initiative to donate leftover fabric and materials to school projects. The new link means that primary schools will have regular access to materials which can be used for art, textiles and drama projects. The factory on Canal Road in Trowbridge usually sends all leftover materials to local recycling plants. You can follow our story on our blog https://airsprung.tumblr.com/ and if you are a local school or charity and would like to be involved, please get in touch on 01225 779103. 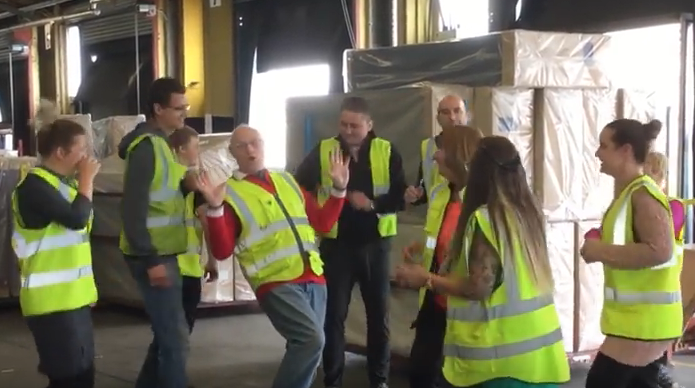 Airsprung Beds may be a 140-year-old company, but last week #TheRunningManChallenge showed that you can teach an old dog new tricks. The challenge has been trending on social media for the last two weeks and a multitude of people are getting involved including British police and celebrities such as Piers Morgan. We had some fantastic volunteers taking part in the video, which can be found on the Airsprung Direct Facebook page so please visit our page and give us a ‘like’. Who knows what the next trend may bring, but we’ll be ready! The Sleep Council have released a series of short funny videos to raise awareness of some of the key reasons for investing in a new bed on a regular basis – instead of waiting until it collapses or until you can’t stand the aches and pains from an uncomfortable bed any longer. 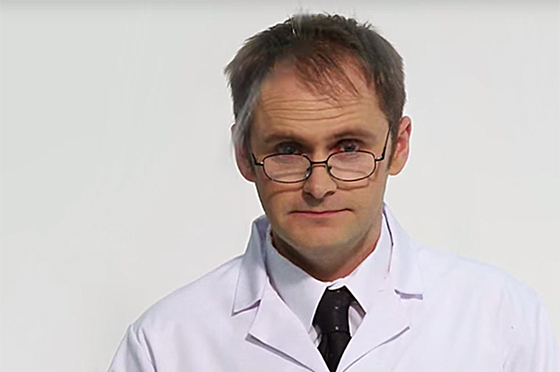 On the video below he shows you how to make sure your bedtime doesn’t turn into a mite’s mealtime – a mattress over seven years old has absorbed two baths of bodily fluids and half a stone of dead skin! Yuck! The full set of videos can be found here and you can see more about the work of the Sleep Council at www.sleepcouncil.org.uk. Innovation is key for Hush-a-Bye. Innovation is the key word for Hush-a-Bye Beds. Last year’s Bed Show saw the introduction of a new gel infused latex range branded Coolwave®, and the revamped range will be launched at this year’s show. The original concept behind Coolwave was to tackle the inherent problem with memory foam mattresses, i.e. overheating. As Andrew Richards, sales director at Hush-a-Bye explains; “There are many gel infused memory products on the market, but starting with a ‘warm’ product and then trying to make it cooler didn’t seem to make sense to us. So we started with an inherently cooler product that offered the same pressure relieving properties and looked to make that cooler still.” Latex is a well-established material and has many advantages over memory foam. As Andy says, “We were convinced by independent research that show that Coolwave latex gel not only absorbs heat more slowly than memory foam but also shows that heat and moisture penetration is reduced significantly. 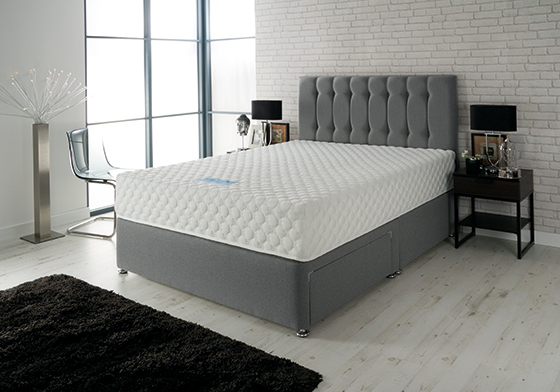 Added to that, latex recovers its shape considerably quicker than memory foam.” The Coolwave latex range has a completely fresh look for 2015, and the rest of the range has also been enhanced with a new range of non-turn mattresses, all featuring pillow tops.